We’re here to provide assistance with equipment or software used in computer labs, classes and employee offices. Bates’ Information Technology Department provides a wide range of support to meet the mission and goals of the entire college. At the beginning of every quarter we will be deleting current student profiles and students will get a brand new profile. If a student has saved any documents, favorites or downloads not to their “ Personal folder” shortcut then these items will be lost. 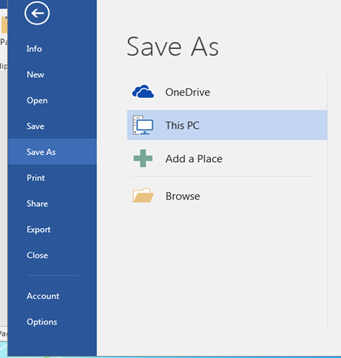 Below is an example of how a student should save to their personal folder on the network. Please make sure all your important items you want to keep are saved in this manner. 1. 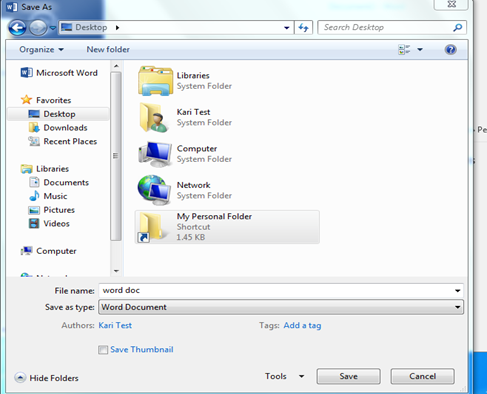 First create an office program document and save to “My Personal Folder” not the one with your name. 3. Click on left side “Desktop“. Click on right side “My Personal Folder“. Click the “Save” button. Another option is to create a shortcut if you don’t have a “My Personal folder” by typing in the search \\here\students\personal\” your username” Save your documents here.